A clean room is not enough: How to avoid nanosized particles. 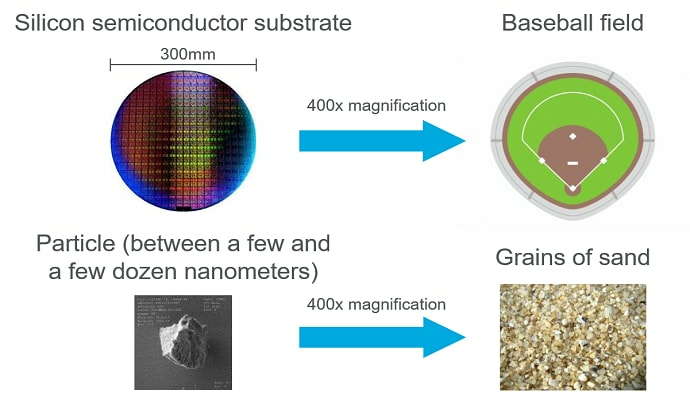 The currently dominant semiconductor process size is in the range between a few and a few dozen nanometers. That means if a nanosized-particle smaller than a virus (hereinafter simply “particle”) is present on a silicon substrate, it could cause a defect in the semiconductor device, lowering the production yield (i.e., the percentage of good chips produced in a manufacturing process). Preventing the occurrence of defect-causing particles is not so easy, however, as it is comparable to cleaning up a baseball field until no grain of sand larger than a few dozen microns in diameter remains on the ground (Figure 1). Despite the difficulty, developers of semiconductor production equipment have continually struggled to suppress particles. One of the measures to suppress particles in semiconductor production processes is to use a clean room, which ensures that the concentration of airborne dust particles is reduced to a designated level under a temperature- and humidity-controlled environment. However, clean rooms alone cannot entirely prevent the occurrence of particles inside each unit of semiconductor production equipment. As Tokyo Electron (TEL) offers one of the largest portfolios of semiconductor production equipment in the world as their developer and manufacturer, the company has been studying measures to control the occurrence of particles in every one of its products and has successfully developed a wide variety of innovative particle reduction technologies.